An example of paper prototyping used by Tonic3, Texas. Bringing an idea to life can be intimidating at best. Which process do you follow if any? Will you test your idea, first, or create and market directly? At which stage do you consider and incorporate user feedback? When’s an idea complete? All these questions can be answered by using prototyping as a methodology for design. What is a prototype? In short, it’s a physical or visual way to show how something will work without it being fully functional or designed — yet. This can apply to virtually anything: An item’s form or appearance and how an item’s to be used. At SiGNL, we use prototyping to design complex technological solutions in simple ways. Take an upcoming project, for example, where we were tasked with creating an interactive, digital experience spanning seven rooms. In order to do so, we split the rooms amongst team members and assigned each room a theme. From there, we embarked on initial research around locations, the look and feel of each room, as well as product tie-ins and learning outcomes from a client’s perspective. Using this research — Just Enough Research, we might add — we delved into prototyping. This is not to be confused with a Minimum Viable Product, which would have enough features and functionality to satisfy early adopters. No, a Minimum Viable Prototype is a low-quality, cost-effective first model of an idea, product, experience or system made using any material that falls within those constraints. Of course, there are varying degrees of prototype complexity, where a Minimum Viable Prototype provides just enough information and direction for a fully-fledged prototype to take form using software tools such as POP or InVision. But that’s where you end up. Where you start is with a MVP. Our prototyping consisted of cardboard, thick paper, glue, colour markers and pens and a dash of creativity. As such, we were able to create an example of each room, as well as its technological requirements, in a cheap, adjustable way to factor in user or client feedback. What’s normally a screen is now a piece of cardboard, coloured in with a black marker. What otherwise would be a robot arm is a piece of Lego. What’s usually a VR headset is a drawing. You get the idea. The benefits of prototyping are vast, far more than its drawbacks. 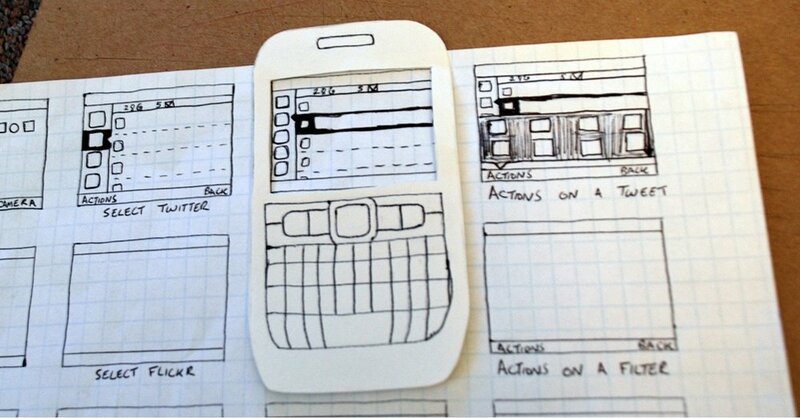 Use of the POP application, a prototyping tool which instantly adds functionality to drawings. The first and most obvious benefit is to give an idea form. Ideas are better communicated and understood when presented visually. Users testing your prototype will likely be its intended audience, having been sought out by you or your team, testing said prototype in a specific environment and context related to their experience, making their feedback all the more valuable. Making changes to a semi- or fully developed prototype can be time-consuming (nevermind costly! ), having to break apart and rebuild to incorporate user and client feedback. With a minimum viable prototype, you’re able to bypass both time and money. A physical model often illustrates intended functionality better than verbal or text specifications. Developers, furthermore, are able to use physical models to add and remove functionality as they experiment and test ideas. A physical model provides an example of a product, as close to its intended real-life, functional counterpart, as possible. This provides clients and stakeholders with a consensual idea to invest in, ahead of its build and actualisation. Prototypes act as a sign of physical progress and reveal the next tangible, logical steps for an idea or product’s development and create an atmosphere of fun and excitement amongst those involved in its creation. Don’t overthink it. Make. Play. That’s when latent creativity comes to light and innovations are born. Your constraints are your “keys” to making creative leaps. If you aim for perfection, you’ll never create a prototype. Perfection is reserved for a full-fledged product, and is, even then, susceptible to change. You’ve made a prototype! Great! Take it a step further by 3D printing it. 3D printing makes the prototyping process immediate and iterations are a synch by being a print away. If there’s a tool, methodology or material you can use to prototype faster, use it. Don’t waste time wondering about colours, fonts or icons — those can be pondered about at a later stage. The devil isn’t in the detail — yet. Luckily, Standford D. School’s already gone through the effort of creating a process for prototyping with your team. While this is one of many ways to go about it, it provides a departure point for experimentation and further investigation.